(CNN) -- Aides to Alaska Gov. Sarah Palin improperly obtained her former brother-in-law's state police personnel files and cited information from those records to raise complaints about the officer, the head of Alaska's state police union said Thursday. Alaska Gov. 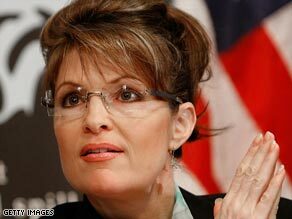 Sarah Palin has put an aide on leave during a probe into the firing of the public safety commissioner. "It's apparent to us that the governor or someone on her staff had direct access to his personnel file, as well as his workers' comp file, and those are protected," said John Cyr, executive director of the Alaska Public Safety Employees Association. Palin, now the Republican nominee for vice president, is battling allegations that she sacked her public safety commissioner in July because he refused to fire Trooper Mike Wooten, her sister's ex-husband. But a spokesman for GOP presidential candidate John McCain's campaign released documents late Thursday indicating Wooten signed a waiver during his divorce that allowed his entire personnel file to be released. "When you're a real reformer like Sarah Palin, who isn't afraid to take on entrenched political interests, scurrilous attacks and empty allegations come with the territory," campaign spokesman Taylor Griffin said. In an ethics complaint filed Wednesday, the union names the governor and three aides, one of whom cited Wooten's records in a tape-recorded call to a state police lieutenant in February. Monegan said no one directly demanded Wooten's dismissal, but the trooper was the subject of "constant" questions or comments "either verbally or in e-mail saying, 'Is this the kind of trooper that should be representing the troopers?' or 'This is not the kind that we want to have as a poster child.' "
Tonight, the man at the center of the Sarah Palin troopergate scandal. Did she abuse her power as governor? Palin’s ex-brother-in-law speaks exclusively to CNN. "In the center of all of the controversy is Trooper Wooten's continued employment," the former police commissioner said. "My job was to provide passion and support to 900 people -- almost 900 people -- in the Department of Public Safety, and one of them -- which included Trooper Wooten -- was an irritant to her." Palin said Monegan was sacked because of disagreements over the state budget. His firing is under investigation by the Alaska Legislature, but Palin's attorneys filed papers this week to request Alaska's Personnel Board take over the probe. In August, Palin admitted members of her administration had contacted people in Monegan's department more than 20 times regarding Wooten since she took office in December 2006. "The individual inquiries taken by themselves are one thing. Many of these inquiries were completely appropriate; however, the serial nature of the contacts understandably could be perceived as some kind of pressure, presumably at my direction," she said. But in papers requesting the probe be transferred to the personnel board, Palin's lawyer called Wooten a "rogue trooper" who threatened the governor's family during a bitter divorce and custody battle. Thomas Van Flein, the governor's attorney, said it was appropriate to complain to the head of the department about a trooper the Palins believed posed a threat to their security. Van Flein had no immediate response to the union complaint. Palin had been complaining to state police officials about Wooten since before she became governor. In March 2006, Wooten received a five-day suspension for drinking beer in his patrol car, illegally shooting a moose under his wife's hunting permit and using a Taser on his 10-year-old stepson "in a training capacity." Wooten, in an interview with CNN's Drew Griffin, said he wanted to be "the best father I can be to my children" and "the best trooper I can be to the state." "You know, I was young and I made mistakes," Wooten said. "And I was punished for those mistakes. I learned my lesson. They're behind me." Van Flein, Palin's lawyer, said Wednesday the Palins were unaware any action had been taken against Wooten until after Monegan's firing. In the February 29 call by Frank Bailey, Palin's boards and commissions director, to state police Lt. Rodney Dial, Bailey complained there had been "absolutely no action for a year on this issue." During the call, he said there was some "really funny business" about a worker's compensation claim Wooten had filed and suggested he lied about a health condition on his state police job application. "That's extraordinary for them to reference that," Cyr said. Police application files contain results of background checks and reference letters, "and those are sealed. Even Trooper Wooten doesn't have access to those." And during the February conversation, Dial questioned how Bailey had obtained information that was "extremely confidential." "I'm trying to find out how it was determined by anybody that he had indicated something on his application that later was found to be not true," he said. Bailey replied, "I'm a little bit reluctant to say." But he added, "Over in admin is where, you know, we hold workers' comp right in there." Efforts to contact either Bailey or his attorney on Thursday were unsuccessful. But the McCain campaign released copies of a February 7 waiver Wooten signed during divorce proceedings that authorized the release of his personnel file, "including but not limited to any and all disciplinary actions and or complaints, and personnel records and actual shift and date worked records." "Mike Wooten signed a waiver as part of the divorce proceedings, and as a result the information was in the public domain," Griffin, the campaign spokesman, told CNN. When she turned over the recording of the February 29 call to the Legislature, Palin said she was "truly disappointed and disturbed to learn that a member of this administration contacted the Department of Public Safety regarding Trooper Wooten. At no time did I authorize any member of my staff to do so." Palin placed Bailey on paid leave until the investigation is over. Cyr said the union's complaint has been in the works since August 13, when the Bailey-Dial conversation was disclosed. "Of course, we had no way of knowing that Gov. Palin was tapped to be the vice president," he said.